Weight: 0.5g 0.6g 0.7g 0.8g 1g or according to to made . 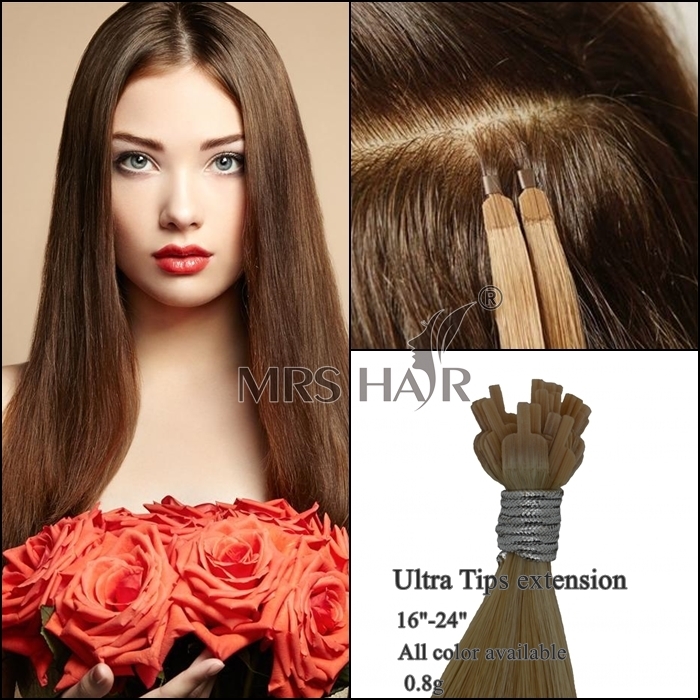 ​In uk, This new tip hair extension called Ultra tips hair , also can be called T tip hair . Ultra Tips are the revolutionary new hair extension system that is re-usable without the need to ever re-tip the hair. This new extension system does not require heat or glue and is completely re-usable time and time again. Lies completely flat with the natural flow of hair and is fitted with the Ultra Tip Lock. This hair can last 9+ months if correct aftercare is followed and is our most popular fitting method. Ultra Tips™ Hair Extensions is a new hair extension system that is re-usable without the need to ever re-tip the hair. Double drawn hair . single drawn hair. It’s ideal for great coverage as each bond lays on top of the client hair, and due to the fan shape of the bond, it disperses over the hair for fantastic coverage.